Following an initial sighting about three years ago, Porsche has unveiled the Cayenne Coupé – a sleeker-roofed version of its original SUV nameplate. This joins the growing ranks of sleeker-roofed SUVs within the Volkswagen Group range comprised of the Audi Q8 and the Lamborghini Urus. 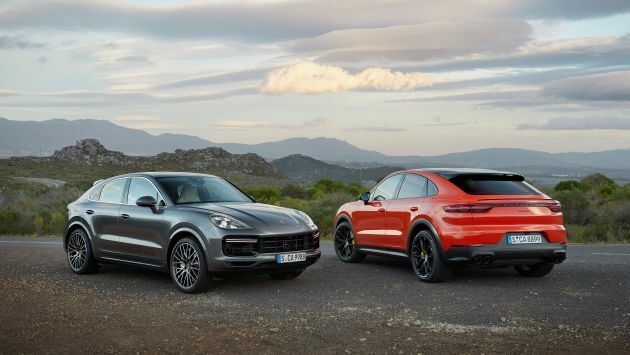 “The significantly more steep roof line that falls away to the rear makes the Cayenne Coupé appear even more dynamic, and positions it as the sportiest-looking model in the segment,” said Style Porsche vice president Michael Mauer. 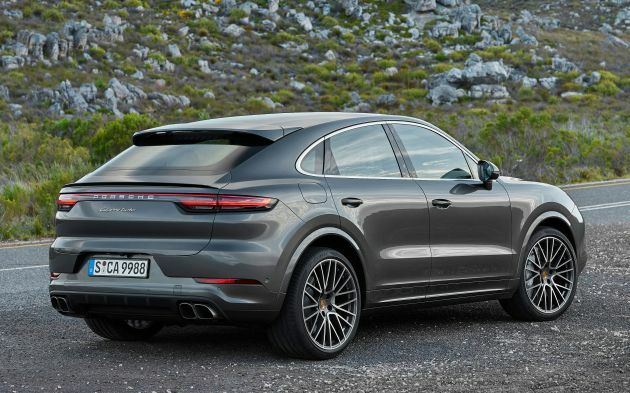 The key change in aesthetic comes courtesy of a sloping roof that has been lowered by 20 mm relative to the E3 Cayenne, while redesigned rear doors and fenders broaden the section by 18 mm. Atop the redesigned rear end is a an adaptive roof spoiler that is part of the Porsche Active Aerodynamics (PAA), which extends 135 mm at 90 km/h and above for increased downforce on the rear axle. With the new roofline comes new roof options as well. The Cayenne Coupé comes with a panoramic fixed glass roof as standard, or a carbon-fibre item can be specified. For the former, the integrated roller blind offers shade and insulation against heat and cold, says Porsche. The second row within the Cayenne Coupé comprises two individual seats as standard, and occupants here are seated 30 mm lower than those in the rear seats of the full-sized Cayenne, thus offering ‘plenty of headroom despite the vehicle’s sporty lowered silhouette’. Alternatively, a standard comfort rear seat configuration can be specified. Luggage capacity here is 625 litres with seats in place and 1,540 litres with the rear seats folded, or 600 litres and 1,510 litres in the Turbo; the full-sized Cayenne takes 770 litres. Standard equipment across the Cayenne Coupé range includes speed-sensitive Power Steering Plus, 20-inch alloy wheels, Park Assist at the front and rear, a reversing camera, Porsche Active Suspension Management (PASM) and Sport Chrono. Porsche says the Cayenne Coupé benefits from all the technical highlights of the third generation, which we can take to mean the inclusion of Porsche 4D Chassis Control, three-chamber air suspension, rear-axle steering and Porsche Dynamic Chassis Control (PDCC) electronic roll stabilisation. Interior equipment should also follow suit with the latest in Porsche Communication Management (PCM), where a 12.3-inch touchscreen provides access to infotainment and vehicular setups. At launch, the Cayenne Coupé gets two petrol engines – a 3.0 litre turbocharged V6 with 340 PS and 450 Nm of torque, rated at 9.4 l/100 km and 215 g/km for fuel consumption and CO2 emissions respectively, and a 4.0 litre biturbo V8 with 550 PS and 770 Nm of torque, rated at 11.4 l/100 km and 261 g/km for fuel consumption and CO2 emissions respectively. The base Coupé does 0-100 km/h in six seconds and a 243 km/h top speed, while the Turbo Coupé does the century sprint in 3.9 seconds and a top speed of 286 km/h. Of course, being built upon the MLB Evo platform which underpins the Cayenne, the Coupé stands to gain more variants with varying levels of electrification; the Cayenne E-Hybrid has a total system output of 462 PS and 700 Nm of torque from a 3.0 litre turbo petrol V6 mated to a 136 PS electric motor. Watch this space. The post Porsche Cayenne Coupé unveiled – sleeker X6 rival appeared first on Paul Tan's Automotive News. 0 Response to "Porsche Cayenne Coupé unveiled – sleeker X6 rival"